Palmia Observatory: Hooray, Part 2 of August 21 total eclipse with night sky and solar images; Finding close star Regulus; How did Eddington get star images close to the corona? ; When is your next eclipse? 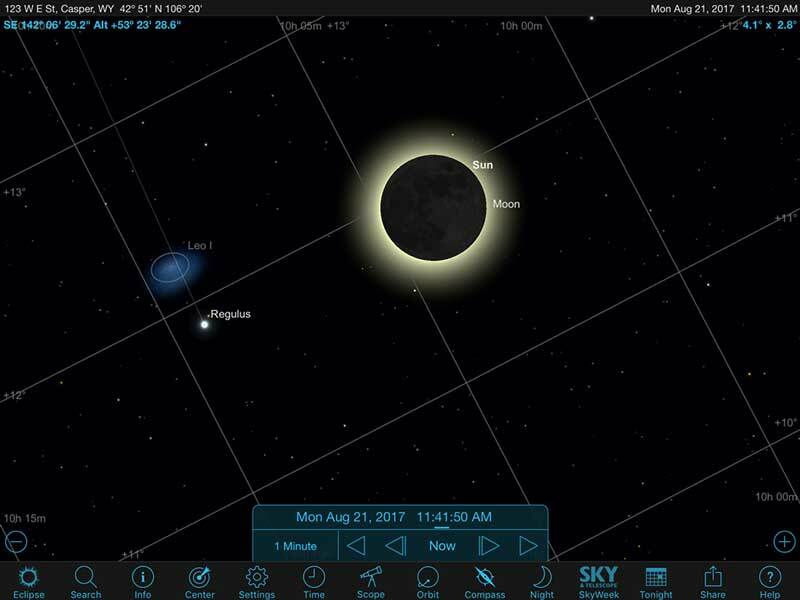 Hooray, Part 2 of August 21 total eclipse with night sky and solar images; Finding close star Regulus; How did Eddington get star images close to the corona? ; When is your next eclipse? Well we are back at the observatory after a fantastic time going through Yellowstone National Park and then spending four days at Astrocon 2017 conference in Casper, WY and then to top that off, staying there to observe the night sky and the total solar eclipse on August 21. Wow, what an experience for we two first time total eclipse viewers. In this part 2 of the blog postings, describing those happenings, let's start first of all with one image of the night sky taken at 8000 feet in the mountains next to Casper. 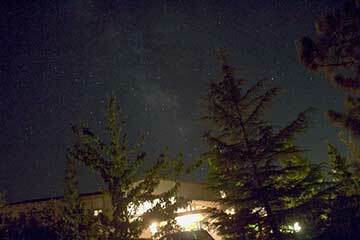 This 60-second image was taken with an 18mm DSLR lens on a non-tracking tripod. We are not used to being able to see the Milky Way at all unless we specifically go to a darker sky site, so this was a real treat and we just sat under the stars for a long time just enjoying the spectacle. 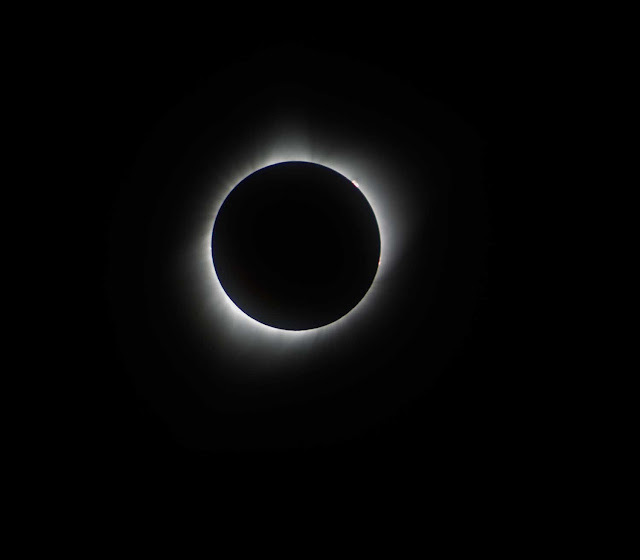 Ok, now after spending four days with 940 other (amateur) astronomers at Astrocon, and then, spending the Monday at Casper College viewing site, with many of those attendees, observing the total eclipse, Wow, it was simply fantastic. We set up with our non-tracking mount and 300mm telephoto lens and waited it out as described in the previous August 21 blog post which presented the IPhone photos of the days events. Of special interest there was the before totality landscape view and the landscape view during totality. 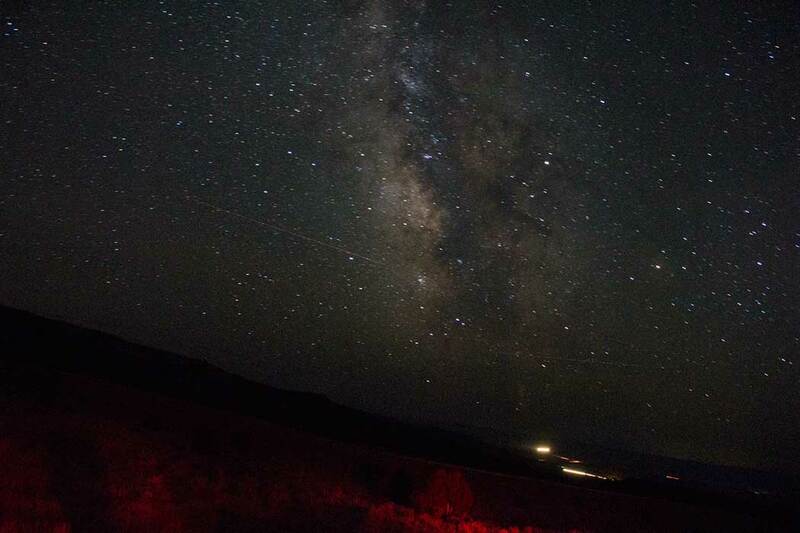 It was so neat to be standing in darkness and yet be able to see the lit sky in the distant horizon! We felt the temperature change but did not notice any strange animal behavior other than the ooh-ing and ahh-ing of the other astronomers near us. The photo below shows the sun just a few minutes after first contact and the sun appears a bit excited by the whole thing and displays some sunspots. Ok, finally totality arrives. I tried to take photos of the Diamond Ring and Baileys Beads, but did not get any images. I did experience seeing the diamond ring but wasn't sure if I could see anything more and it was not captured in my camera. 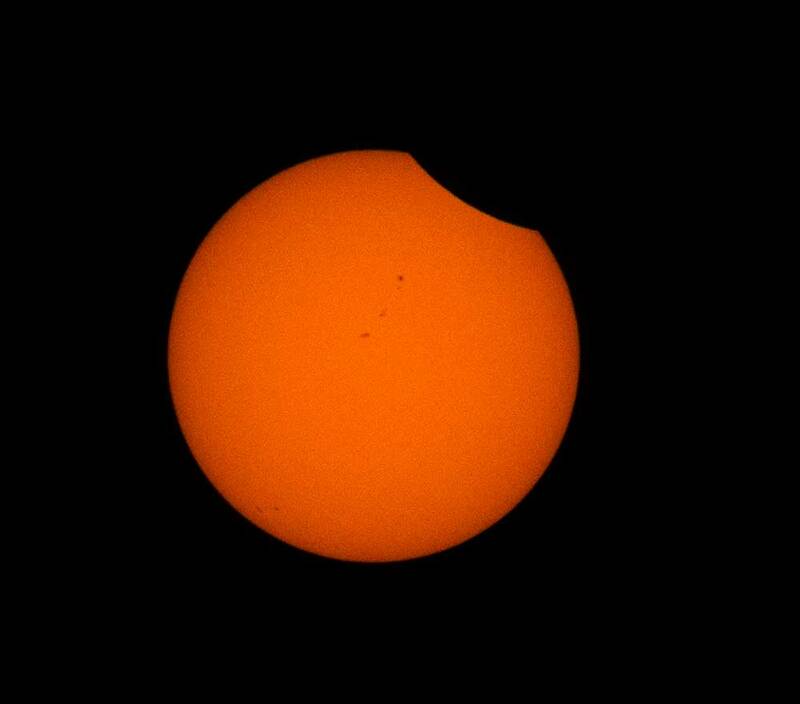 But the two camera images taken during totality are pretty neat! The first was taken at 1/30 second exposure to capture the near corona and the second was taken with 1/8 second exposure. There are many other things I probably should have done during totality but just over 2 minutes is not much time to do many things and still personally see and enjoy totality with your own eyeballs. There will be a next time and also many other more expert OCA members will have collected images using tracking mounts, higher power scopes and fully automated camera filter and exposure settings. It will be neat to see what they managed to capture. Now, where are all the stars that are supposed to be visible during the total eclipse? Some visual observers reported seeing Venus and some other stars, but I did not see any such thing. I guess being busy and making sure that I captured at least a couple of images during totality and remembering to put the solar filter back on kept me pretty occupied and yet I did have a spare moment to look around and see what the darkened landscape looked like. To see if any stars were visible in any of our captured images, the 1/8 second exposure of the totally eclipsed sun was imported into AIP4WIN for further analysis. See the screenshot below. Yes, there is a little bright dot in the lower left of the camera image that might just be Regulus, a magnitude 1.4 star that should be quite close to the sun. The camera field of view with the 300mm lens is about 2.8 by 4.8 degrees and the full screen image is shown below in the screenshot. The yellow profile line stars at the lower left, right next to Regulus?, and proceeds up to the right. Note how the profile of the solar corona is still so bright that many of the camera pixel are saturated with too much light, but that only one bright star shows up in the image. Let's do some image analysis using this image. The brightest pixel in the star is 2237 ADU and after subtracting the camera bias value of 2048, the pixel value is 189. 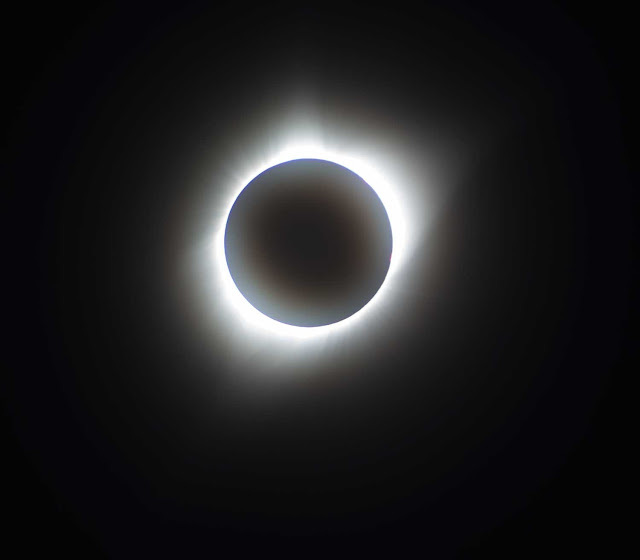 The maximum pixel value in the corona is saturated at 15030. An analysis of the other corona image taken with 1/30 second exposure also had some pixels saturated at 15030, so the corona is very bright. How much brighter is the corona than the little star, Regulus? Well, let' use a simplified estimate of the corona to be represented by a brightest pixel value of 15030 -2048 = 12982, which accounts for the camera bias value. Then we can calculate the magnitude difference between the two objects: Regulus at 189 ADU at 1/8 second and corona at 12982 ADU at 1/30 seconds. So the magnitude difference between these two objects is equal to 2.5 * log (30 * 12982 / ( 8 * 189 )) = 6. 1.4 - 6 = -4.6. This value is a bit dimmer than the usual description of the solar corona as being as bright as the moon, which has visual magnitude = -8.3. But the measurement made here is based on just one estimate of the brightest pixels seen, so this estimate seems close enough for now. Oh, by the way, are we sure that that little star is really Regulus? Check out the Sky Safari Pro screenshot below which shows the same approximate filed of view for the position of the sun/moon during totality in Casper, WY. Yes, the position of Regulus does indeed seem to agree very well with the bright little dot in the camera image. The clock time in this screenshot was left at local California time and is one hour later than local time in Casper. Now, the question that still remains is how is it possible to see dim stars right next to the sun given that the corona is so bright? How did Eddington and others verify the bending of light by looking at stars that were very much closer to the limb of the sun? I don't see what I could do with my little setup to see stars that lie within the region of the corona. Readers of this blog will recall how back in February 5, 2017, I took an image of the night sky centered on the exact location where the sun would be on August 21. I hoped, or really just imagined, that I would be able to overlay these two images, one with the sun present and the other without the sun and pretend that I was also looking for the effects of the bending of light by the sun. Of course, my resolution would never be sufficient to actually do that test. In fact one of the presenters at Astrocon, Dr. Don Bruns, has spent many years analyzing how that measurement was done and how it is feasible now with modern amateur equipment to repeat that famous observation and perhaps even get higher accuracy that was ever done. Most professional astronomers have not used the Eddington approach now because there are other methods based on radio wave propagation that are much simpler and more accurate. It will be interesting to hear back how Dr. Bruns observations and analysis went. So, now the only question remaining is whether to go the July 2019 total eclipse in Chile and see the southern sky or wait it out for the 2024 total eclipse in the USA. What are you planning to do? I'm voting for Chile, 2019 first. My chore is to get Resident Astronomer Peggy to agree too! If you haven't experienced a total eclipse, now is the time to start to prepare!